March 6 (UPI) — Fast food chain McDonald’s announced Tuesday it’s now serving fresh beef in its products — a sign the company is moving away from artificially enhanced burgers. McDonald’s said fresh beef quarter-pound burgers are now available in 3,500 U.S. location, and that it plans to roll them out in the rest of the United States by early May. The move means McDonald’s quarter-pound burgers with fillers, additives or preservatives are being phased out and replaced with 100 percent fresh beef. 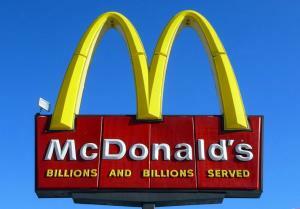 McDonald’s said the announcement is the biggest since it implemented all-day breakfast. Fresh beef is first being served at locations in Atlanta; Miami; Raleigh, N.C.; Charlotte; Nashville; Salt Lake City; Memphis and Orlando, Fla. The announcement followed a 90 percent customer satisfaction rate from tests of the fresh beef — and another announcement from the chain saying it would reduce sugar and fat from its happy meals by June. It is also committing to using only cage-free eggs by 2025 and serving chicken free of antibiotics.